Have you ever thought to yourself, how nice would it be to spend more time outside? If you do not have a nice patio, though, spending time in your yard enjoying the sunset or sipping on your favorite beverage is less than favorable. You may have gone to your local depot store to see if you could try to build your own patio, only to find that the cost of material put anything remotely close to your dreams out of the question. With Broadshield Custom Homes and Contractors, you can have the patio you have always wanted. With many years of industry experience, our concrete contractors not only make your patio stunning but enhance the overall aesthetic appeal of your entire home. From start to finish, we work with you to ensure that what you need is accomplished. Whether you’re looking for a new patio, want to install a polished concrete floor, or just need a large concrete foundation poured, you can count on our home builders’ years of expertise. With concrete, you have a luxurious resting place that is easy to clean with virtually no maintenance at all. From driveways to walks, patios, and more, Broadshield Custom Homes and Contractors believes in providing our customers with excellence. Let Broadshield Custom Homes and Contractors take care of your home for you. Add value to your home, and enjoy the outdoors right where you are. 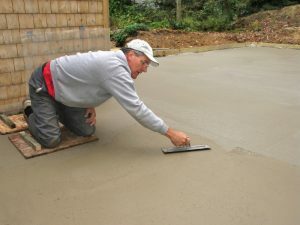 Contact us today to get your estimate on any concrete work we can do.